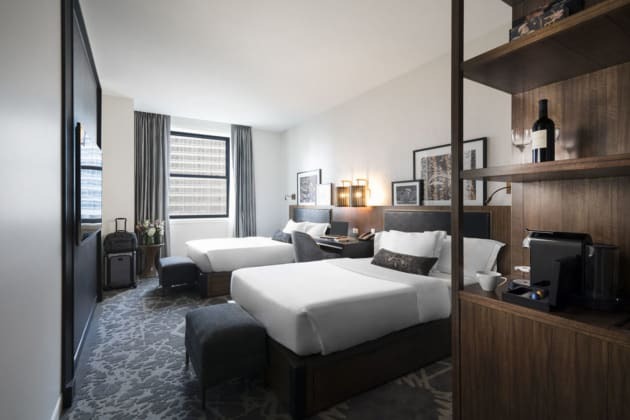 Welcome to the LondonHouse Chicago, Curio Collection by Hilton, a modern hotel set within the iconic London Guarantee & Accident building in the heart of Chicago. 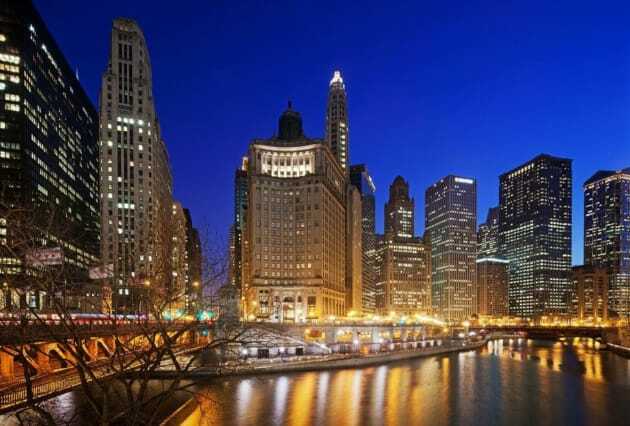 Find yourself on the iconic Chicago River, on the corner of Wacker Drive and Michigan Avenue, just minutes away from Millennium Park and the city's theater and business districts. 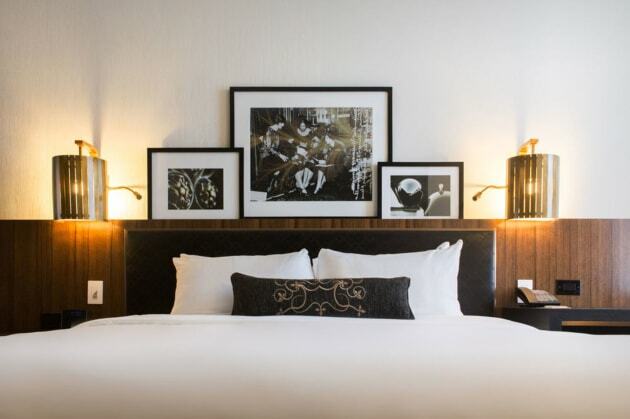 Embodying elegance, outspoken design, and first-class service, the LondonHouse Chicago hotel is one of the city's foremost new hotels. Each spacious guest room features a 55-inch HDTV, complimentary WiFi, and high-tech design features. All rooms exude modern style and timeless elegance. Upgrade to a suite for extra comfort and a separate living area whilst enjoying spectacular views of the Chicago River. Visit LH, our tri-level rooftop bar to sip cocktails and take in some of the best views Chicago has to offer. Work out at the modern fitness center, offering a range of cardio machines and stationary weight-lifting equipment. Find solace at the onsite spa, a serene and calming space where you can enjoy massages and facials as well as beauty treatments such as manicures and pedicures. With 25,000 ft. of meeting and event space, the LondonHouse Chicago hotel can comfortably accommodate conferences, weddings, social galas, board meetings, and everything in between. Accessible rooms are also available. Take advantage of recreation opportunities such as a 24-hour fitness center, or other amenities including complimentary wireless Internet access and concierge services. This Art Deco hotel also features gift shops/newsstands, wedding services, and a television in a common area. Guests can catch a ride to nearby destinations on the area shuttle (surcharge). 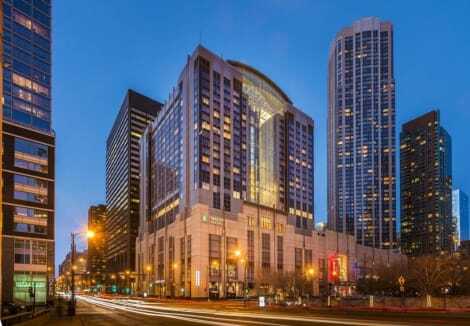 Enjoy your stay at theWit Chicago - A DoubleTree by Hilton Hotel and a destination in itself. 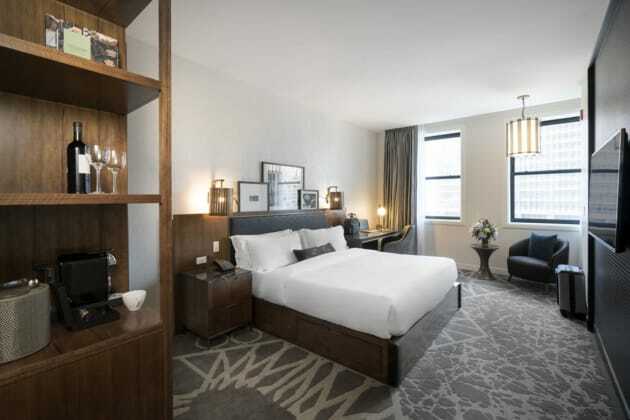 This stylishly located and expressive hotel in Chicago, IL Downtown, sits at the corner of State and Lake streets in Chicago’s downtown Theatre and Loop business district. Reserve a table at ROOF on theWit, an indoor-outdoor lounge on the 27th floor where you can relax amidst views of the city, including the Chicago River, Lake Michigan and Millennium Park.Watch your favorite sports game, movie or host a press conference in SCREEN, a multimedia theater with luxurious seating for 40. Stretch out in the private yoga studio or enjoy modern cardio equipment in the fitness center. Recharge at Spa@theWit with drenching rain showers, a ‘Whisper Lounge’ – unique amongst hotels in Chicago, IL Downtown - and exquisite services that will leave you feeling refreshed.theWit boasts a prime location near Lake Michigan and luxurious accommodations perfect for work or play. Our 310 guest rooms and suites range from 315 to over 800 sq. ft. Enjoy a 42-inch entertainment center, iPod docking station and touchscreen phones for weather and valet. Schedule colorful wake-up calls by famous Chicagoans like Al Capone and Barack Obama.Plan a conference, special event or wedding at this stylish hotel for an unforgettable experience. Along with our creative staff to ensure a superb experience, our 14,000 sq. 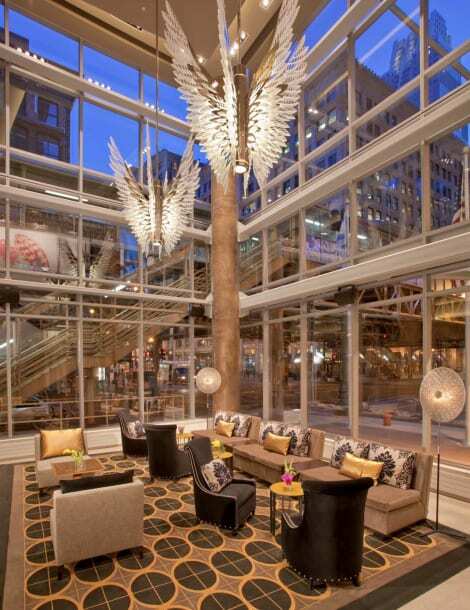 ft. facility offers spaces unlike any other hotels in Chicago, IL Downtown. Stay at Conrad Chicago and be in the center of it all. Enjoy sleek and contemporary accommodations plus access to the city’s most exciting destinations. Guest rooms and suites feature smart lighting, 65-inch TVs, cell phone guest room entry, and luxurious black granite entry ways and bathrooms. You’ll gaze out your window to see one of the most renowned shopping districts in the world, the Magnificent Mile, boasting more than 460 designer boutiques, acclaimed restaurants and world-class museums. On site, there are two inspiring culinary experiences each combining bold flavors and inspired cocktails with unmatched views of the city. Baptiste & Bottle specializes in bourbon and provisions, while Noyane, a seasonal rooftop restaurant, delivers exceptional Japanese cuisine and craft cocktails. 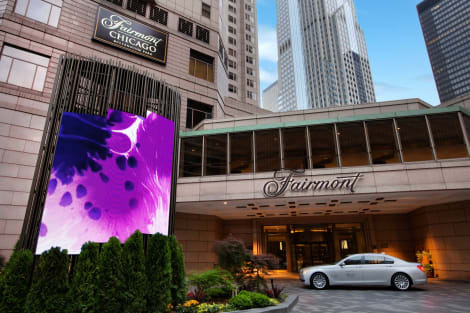 The stylish, state-of-the-art 4-star Fairmont Chicago, Millennium Park puts you in the heart of the windy city, moments away from the lakefront and the bustling hub of Navy Pier. Each room comes equipped with the latest technology, including wi-fi, flatscreen TVs and video games. Guests also have access to an on-site fitness centre and business centre. Sample regional cuisine in the Aria restaurant, get a taste for the exotic in Sushi Club and relax in the ENO wine bar. 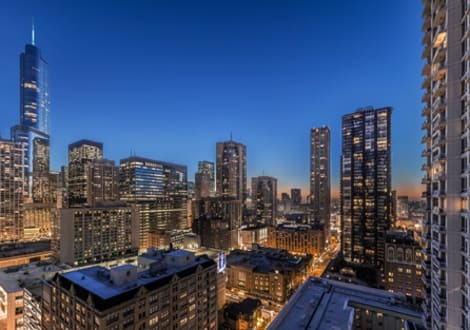 Boasting an impressive façade, the Radisson Blu Aqua Hotel Chicago is in the Lakeshore East neighbourhood of the city, within easy reach of Millennium Park and a short ride from Union Station. The chic rooms come with free wi-fi access, flatscreen TVs and private bathrooms. Keep fit on the running track, in the outdoor pool and the state-of-the-art fitness centre, or unwind in the hot tub before dining on classic Italian cuisine at the Filini Restaurant, followed by a cocktail in the hotel bar. Welcome to our Embassy Suites Chicago - Downtown/Lakefront hotel. Enjoy the convenience of our downtown Chicago hotel near Navy Pier, Magnificent Mile, Chicago River and Chicago's finest attractions.Showcasing spectacular views of downtown Chicago, the Embassy Suites Chicago - Downtown/Lakefront hotel near Michigan Avenue features upscale sophistication and more space to unwind and be yourself. Enjoy a relaxing stay in one of our spacious 455 suites featuring a private bedroom, separate living area with sofa sleeper, two 37-inch televisions, a refrigerator and a microwave.Enjoy our nightly Manager’s Reception* in our bright and spacious open-air atrium featuring contemporary design, a 75 ft. long live eco wall and grand views of the city. Indulge in a complimentary cooked-to-order breakfast each morning.Host a special event or business meeting in our 20,000 sq. ft. of meeting space or celebrate a special occasion in the elegant Chicago River Ballroom. After an exciting day discovering Chicago, unwind at the heated indoor pool and whirlpool, relax in the sauna or rejuvenate in our well-equipped fitness center. *Service of alcohol subject to state and local laws. Must be of legal drinking age.